Ride along with us this winter through the magnificent Arctic landscape as a young Yup’ik girl embarks on a heroic sled-dog journey to save her village. On the search for the reasons of the widening river she meets a raven, a hare, a baby seal and finally three snow bears. 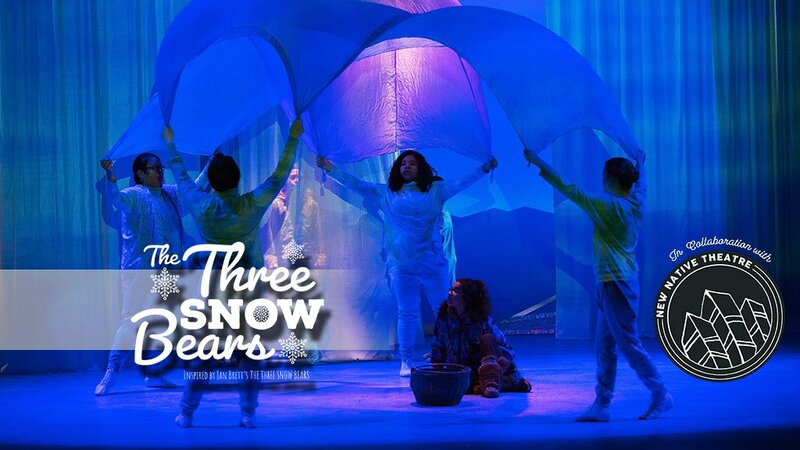 Join us as an endearing Baby Bear and a determined Yup’ik girl meet center stage in our world premiere production. MISSION STATEMENT OF NEW NATIVE THEATRE: New Native Theatre is a new way of looking at, thinking about, and staging Native American stories. Since 2009, NNT has created authentic and transformative plays and events through the lens of the Native American experience. NNT engages artists and audience by 1) Producing commissioned and existing plays by Native playwrights. 2) Producing community created plays about cultural and social justice topics. 3) Presenting the best Native American productions from around North America. 4) Providing an array of theatre training to Native American community members. 5) Engaging in collaborations with Native artists and Native organizations of varying artistic disciplines.